Suppose a blueberry muffin met a corn muffin (perhaps they were co-workers, who gazed longingly at each other from across a crowed room), fell in love (after several attempts at asking Lil Miss Corn Muffin out - she was playing hard to get - she finally said yes; their fate was set), and had little muffin babies (triplets!!) - the little baby hybrid muffins would be these, blueberry-corn muffins....not too corny....not too blueberryish...just perfect. Corn muffins and blueberry muffins are tied as being my favorites. So why not merge the two, right? Upon several unsuccessful attempts - they were either too cornmealy, or too cakey - I had come to the conclusion that I just would have to have one of each. Then I came across a recipe from America's Test Kitchen for corn muffins...it sounded promising. The flour to cornmeal ratio was 2:1, not the 1:1 standard for cornbread. I did adapt it slightly with the addition of blueberry Greek yogurt and frozen blueberries - to cure my muffin woes. I halved the recipe, seeing how it's just S and I, which made 3 jumbo Texas-sized muffins (or 6 normal, standard -sized muffins)....if I made a full recipe they would be calling me to rub buttah all over them at the wee hours of primetime network television....those naughty muffins!! I made these when S was traveling...I ate one warm from the oven and froze the other two, once they were completely cooled; I wrapped them in wax paper and tinfoil. About a week later we thawed them in the oven, at 200 degrees for about 40 minutes, and had them with our Saturday morning coffee. Thawing them in the oven did toast them a bit, but was fine by me.....if I had planned ahead, I could have also let them thaw on the counter overnight - if you wanted to avoid the toasting method thaw. Preheat oven to 400 degrees; grease muffin tins, both the insides and the tops - muffins will rise over when baking. Whisk together the flour, cornmeal, baking powder, baking soda, and salt. In a separate bowl, add eggs and sugar -whisk to combine- add sour cream, yogurt, milk - whisk again to combine - finally stream in cooled butter while whisking, incorporating butter into wet mixture. Gently fold - do not mix- with a large mixing spoon/spatula just until combined; the batter will be thick, that's okay. Fill the muffin tins with HALF of the batter, glob it in, do not press it down or smooth it out - leave it globby. 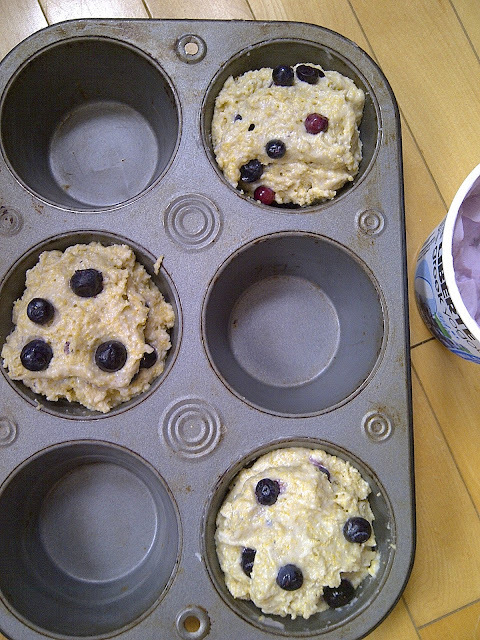 Sprinkle half of the berries over the batter, then fill the muffin tins with the remaining batter, and top with remaining berries - again, do not press the batter down or smooth it out, leave it globby. Layering the berries prevents them all from sinking to the bottom when baking. Bake for 25-28 minutes, or until golden brown around the edges and when a toothpick test yields just a few crumbs attached. 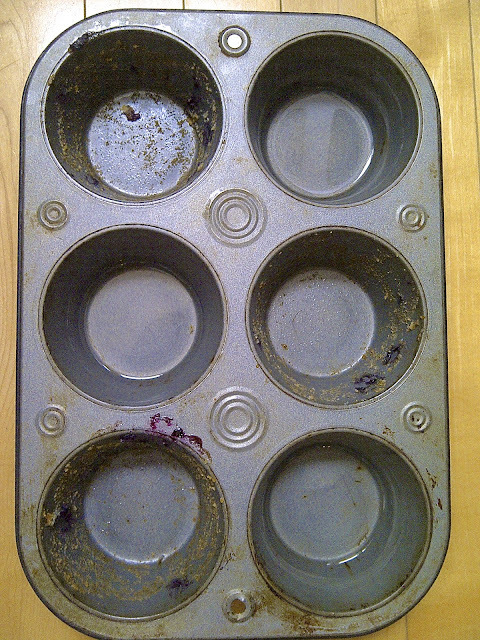 Let the muffins cool in the pan for about 5 minutes, then gently work the edges and muffin tops away from the pan to remove them to a wire rack for another 10 minutes. I love muffins Kim and these look so delicious. I have never had blueberries and would love to try them some day. Have a wonderful week. Some day, you must!! They are the best fresh-picked...whenever we go berry picking, I eat just as much as I can haul. Yes, kinda like the Reese commercials from the 80's....your corrn batter got in my blueberry muffin...well, yeah?....your blueberry batter got in my corn muffin!! Cool, Paula & thanks for stopping by!! Yum Yum! This look so good! Thank you for sharing on Fluster's Creative Muster Party! Thanks Robin, it's always fun linking-up and clicking through other's links!! Thanks, Cathy...I'll check it out! These look great! 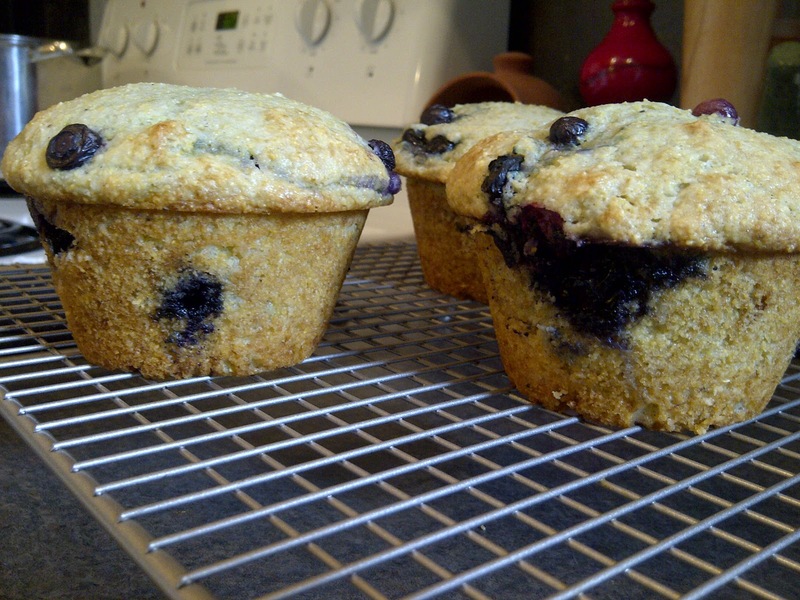 !Never thought of making cornmeal blueberry muffins. Pinned :) Thanks for sharing on Two Cup Tuesday at Pint Sized Baker! These look so good! 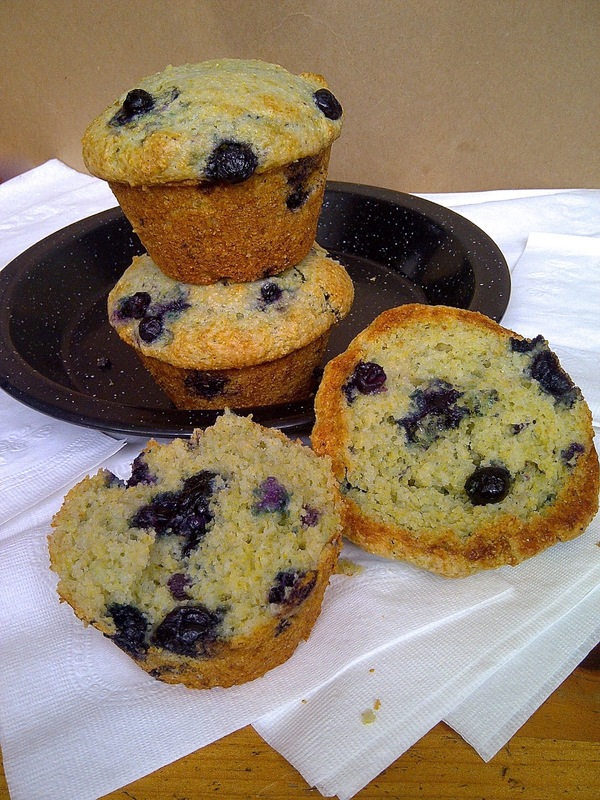 I've never made blueberry corn muffins before! 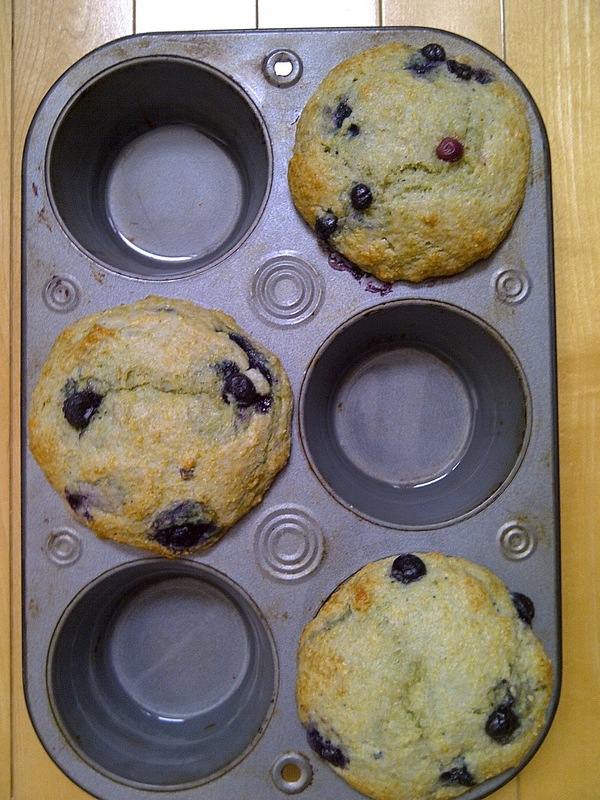 I've made blueberry ones, and corn ones, but never the two together! I'll have to try these out they sound so good!